R first introduced me to sushi was four years ago in Lake Tahoe. I loved the combo of rice and fresh veggies, rice and fried sweet potatoes, rice and tempura. Sushi at non-vegetarian restaurants gives me the heebee jeebees though…I picture fish juice contaminating my veggie sushi (sounds crazy but is it really?). Once, I even told a waitress that I was allergic to fish so to please make my sushi carefully away from the seafood (okay, that is a little crazy). During our Boston years, R would tote home sushi from Franchia, a vegetarian, Korean tea house, when visiting New York for work. During a weekend visit, my brother and his wife brought over Brigid Treloar’s sushi how to cookbook, Vegetarian Sushi – we discovered making sushi wasn’t so hard and was actually sort of fun. Treloar’s cookbook is helpful in terms of the pictures, step-by-step instructions and ideas for elaborate, beautiful rolls. For basic rolls though, you can do without the cookbook and just leave the fillings to your imagination as inspired by the leftover veggies in your fridge. So this Monday, Columbus Day, after a morning volunteering at the headquarters of a certain presidential candidate, I made veggie sushi, miso soup and chili/garlic edamame. Sushi Rice: Make ~3 cups sushi rice according to the package. After the rice cooks, spread ~1/4 cup of sushi vinegar over the rice and mix it in using a rice paddle. Keep the rice covered with a damp dish towel or paper towel to keep the rice from drying out while you make the sushi. 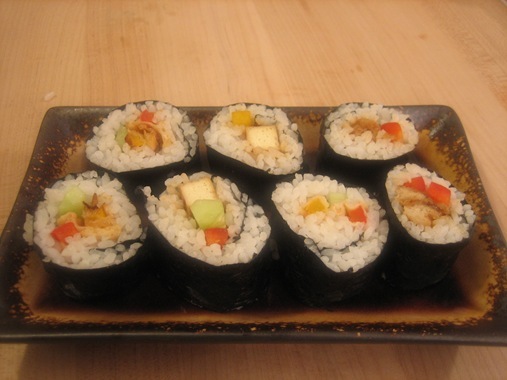 Teriyaki Tofu Rolls: Cut tofu lengthwise into 1/4 inch matchsticks. Put in a sandwich bag with enough teriyaki sauce to coat the tofu and let marinate for at least 30 minutes. Pan fry tofu and let it cool before making sushi rolls. Crispy Unchicken: Pan fry vegetarian chicken pieces until well browned. After allowing to cool, slice the unchicken lengthwise. *Veat makes a good unchicken product, Gourmet Bites, that is 100% vegetarian and unseasoned. It does look a little meaty but it absorbs sauces and spices really well and cooks quickly. I haven’t been able to find these anywhere in awhile but I did recently stock up on a similar soy protein, Vegetarian Chicken Bites, at May Wah in Chinatown, a vegetarian grocery store which will even ship items to you. May Wah’s Vegetarian Chicken Bites are similarly unseasoned. Both of these products are loaded with protein. Bellpepper Tempura: Heat enough oil to shallow fry. Gently beat 1 egg yolk with 1/2 cup cold water. Mix in 1/2 cup all purpose flour. Dip bellpepper pieces in flour batter and coat. Allow excess batter to drip off before placing bellpepper in oil. Fry until golden 4-5 minutes turning as needed. Garden Rolls: Thinly slice peeled cucumbers, red bellpeppers and yellow bellpeppers into matchsticks. Combine all three fresh veggies for a crunchy garden roll. Get creative – you can combine the tofu and tempura, unchikn and tempura and use the tempura alone. You can also combine fresh red bellpeppers with the tofu and unchikn. Position the sushi mat in front of you with the short side closest to you – the white threads along the mat should be vertical. Place the nori sheet on the mat leaving a few slats between the sheet and the edge of the mat closest to you. The creases on the nori should be vertical and the creased side facing up. Use the rice paddle to scoop rice onto the nori keeping in mind that the 1/2 inch strip of nori furthest from you should be left uncoated. Dip your fingers into the water bowl then gently rake the rice with your fingers across the sheet spreading it out evenly. Place the fillings in a row horizontally along the side closest to you. Don’t get greedy and overfill! Use your left hand to hold the fillings in place and pick up the edge of the mat closest to you. Roll the mat forward tightly pausing to gently press down on the roll. Continue rolling until you get to the end of the mat and then gently push down again to reinforce the seal. After you have two sushi rolls, place them next to each other and using a sharp knife (carefully) slice through both rolls at the same time. Cut the sushi into about 1/2 inch thick pieces. Between each cut, wipe the edge of the knife with a wet paper towel. I’m excited to try this — yum! Whenever I cut the outside ends of the sushi, I end up with a mess. It’s as if it wasn’t packed enough or tight enough. Is there a trick to keeping the end pieces together when it’s cut, or having it packed tight enough without the contents being pushed out? ND: The tighter the roll is packed, the easier it is to cut for sure. Another tip that I find works well for cutting is to place two rolls parallel to each other and cut through both in one slice together while holding the uncut end with your left hand (assuming you cut with the right). 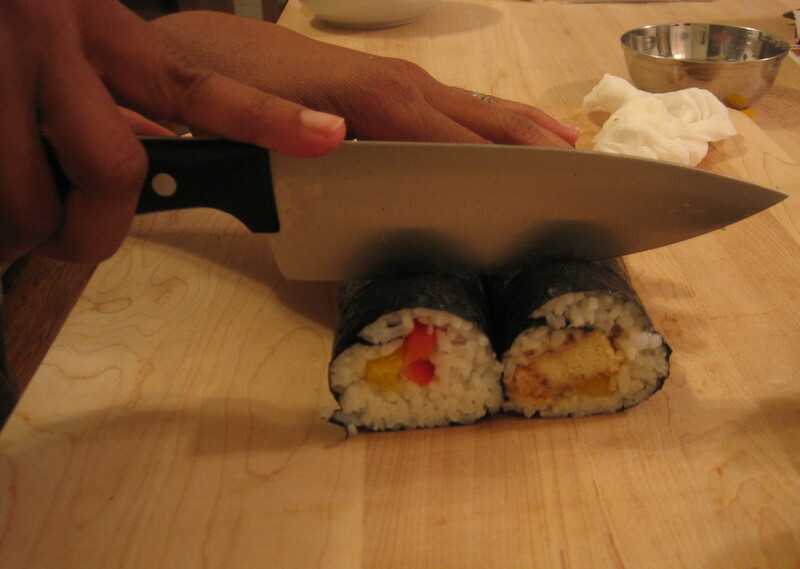 You should also periodically wipe the knife with a damp paper towel because the sushi rice causes a build up of sticky residue that can get in the way of cutting. I hope that helps!